Murmur, 2006, HD video, black and white, sound, 7 min. Hiroshima, 2007, single-screen installation, 16mm film (Digital Master), colour, sound, 18 min. Kirk Palmer first came to Japan in 2005. At this time, when he looked from the foothills on the outskirts of Kyoto over the city occupying the flat basin below, surprisingly, what sprang to mind were photographs he had seen in a book of Hiroshima immediately after the atomic bombing. Palmer learned that Kyoto was one of the candidate cities on a list of potential atomic bomb targets chosen by the US armed forces, and this strengthened the link between Kyoto and Hiroshima in the artist’s mind. His video piece Murmur shows only a bamboo grove in the hills around Kyoto, and the sky, with no imagery suggestive of the atomic bomb or Hiroshima. However, the ominous thrashing of the bamboo when blown by a strong wind evokes a sense of dread. Hiroshima, filmed in the present-day city, presents a matter-of-fact sequence of images of life in Hiroshima today, familiar to any current resident: a local pool, a historic department store, streetcars in motion. Symbolic sites that continue to illustrate and speak of the bomb’s legacy do not appear. Palmer evokes “Hiroshima” (in the sense of the historical event) by intentionally omitting it from his portrayal of present-day Hiroshima, thereby sounding an alarm against historical amnesia. Born 1971 in Northampton, UK. Lives and works in London. Palmer earned an MFA at the Royal College of Art in London, majoring in photography. In 2005, while enrolled at the college, he traveled to Japan on an exchange program, studying at Kyoto City University of Arts. 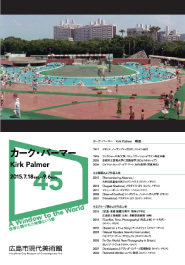 Palmer has shown photographs and film works at exhibitions and screenings in Japan and other countries. In 2015, his solo exhibition Remembering Absence was held at Daiwa Foundation Japan House, operated by the Daiwa Anglo-Japanese Foundation, in London.